Earnings galore continues, with some big-name companies reporting their quarterly results. That will continue after the close on Thursday as well. So far, we’ve got our eye on a number of top stock trades heading into Friday. Here are five of them. On Wednesday after the close, Visa Inc (NYSE:V) delivered what long-term investors have become used to: a top and bottom line earnings beat. The result? Shares are shooting to new all-time highs. While Visa isn’t the cheapest stock in the market, keep in mind it runs a near monopoly over a secular trend toward credit and debit. It’s also got insanely high margins. Over $124 and V continues to look attractive. Bulls should buy on pullbacks to the 100-day moving average. 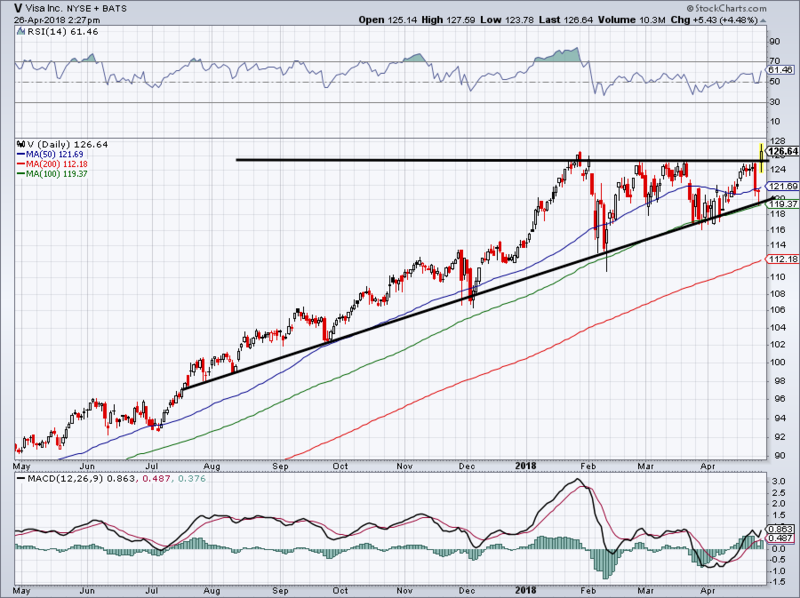 There’s a reason Visa was one of 8 uptrend stocks expected to keep on rallying. Like Visa, Advanced Micro Devices, Inc. (NASDAQ:AMD) beat on earnings and revenue estimates. It grew gross margins and upped its revenue guidance. It resulted in a 10% rally on Thursday. As we said in reaction to the earnings, AMD could struggle to advance through its major moving averages, an area that’s slowing shares down now. 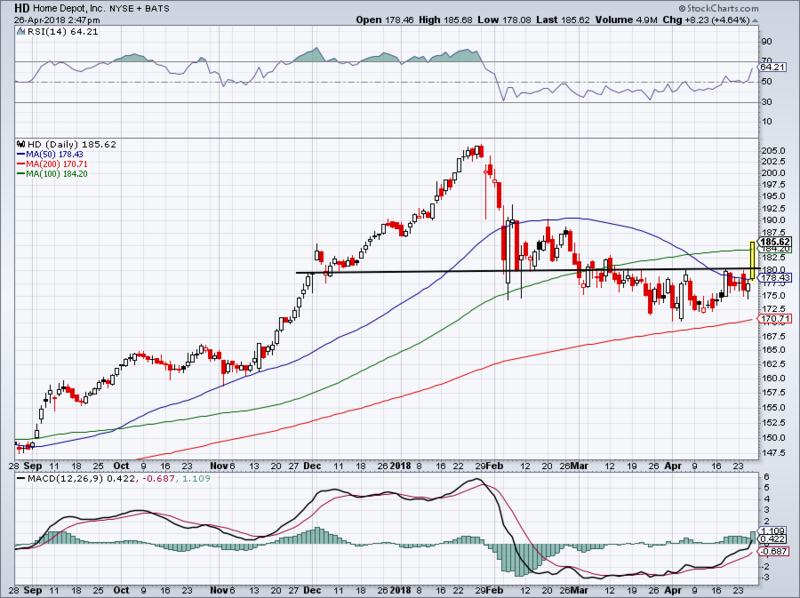 Above $10.50 is best, but so long as AMD remains above support near $9.50 I will continue to like it. Business is good, the valuation is reasonable and shares can climb toward $13 as long as the broader markets hold up. Another top and bottom line beat (is this getting boring yet?) also ignited a rally in Facebook, Inc. (NASDAQ:FB). Shares jumped some 10% on the day, a massive move for a now-$510 billion market cap company. Where does that leave the stock? The rally put FB stock back above its 50-day and 200-day moving averages. It touched but hasn’t yet pushed through its 100-day moving average though. Looks like the pullback into the $150s was a big-time buying opportunity, something InvestorPlace readers shouldn’t be surprised by. How much upside is left though? 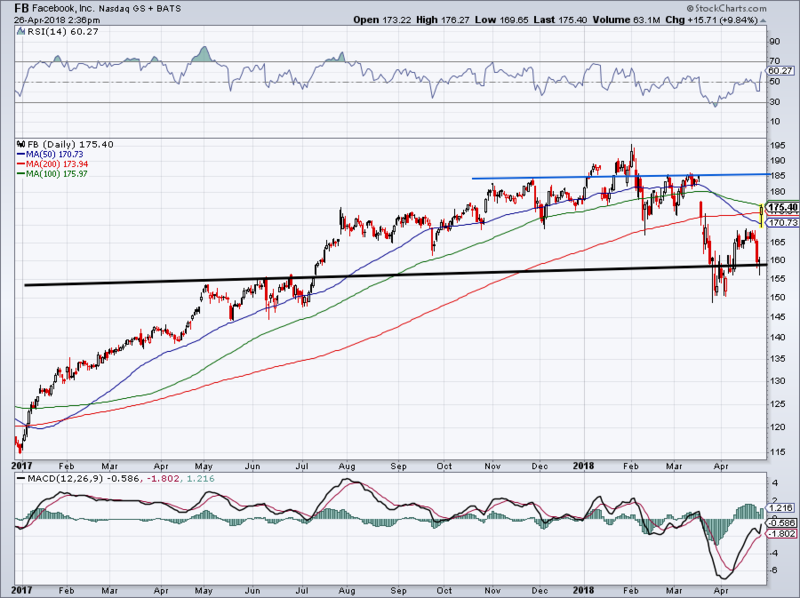 I’d expect the $185 level to act as resistance, provided that FB stock can get that far. 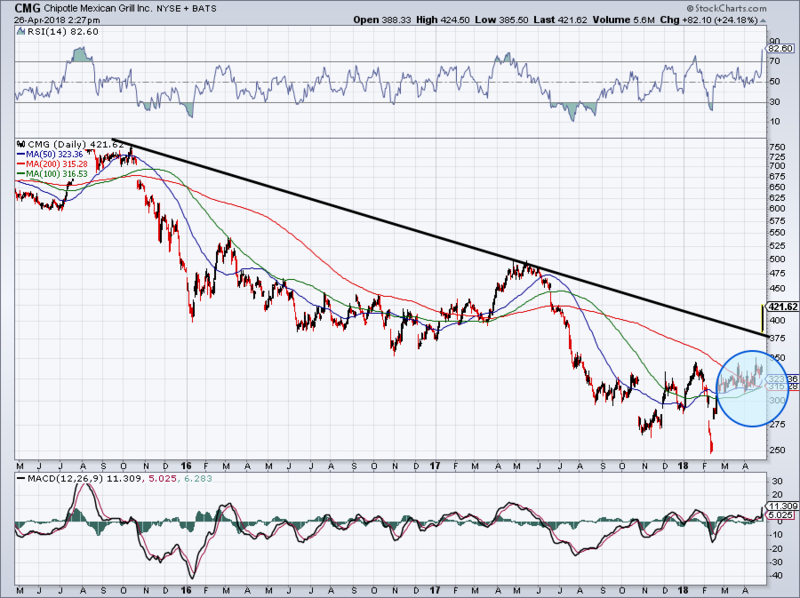 Should it fail to, we’ll likely see shares bounce around in a consolidation phase. Let’s see where it finds support and how high it can push before taking a new position. When I previewed Chipotle Mexican Grill, Inc. (NYSE:CMG) on Wednesday, I didn’t expect a 25% post-earnings rally. Sheesh, look at this monster! On a move over $340 we were looking for $400 next. Now at $420, CMG stock has cleared that mark with ease. The momentum is back with the bulls and in a big way. A “golden cross” has formed, which is a bullish development when the 50-day moving average crosses above the 200-day moving average. Should we call it a double golden cross when the 100-day moving average also crosses above the 200-day in the same session? I’ve never seen it happen, but it’s hard to be bearish about it. CMG should have support between $380 to $400 and while shares could disappoint short-term bulls with some consolidation, my guess is that CMG is heading higher in 2018. 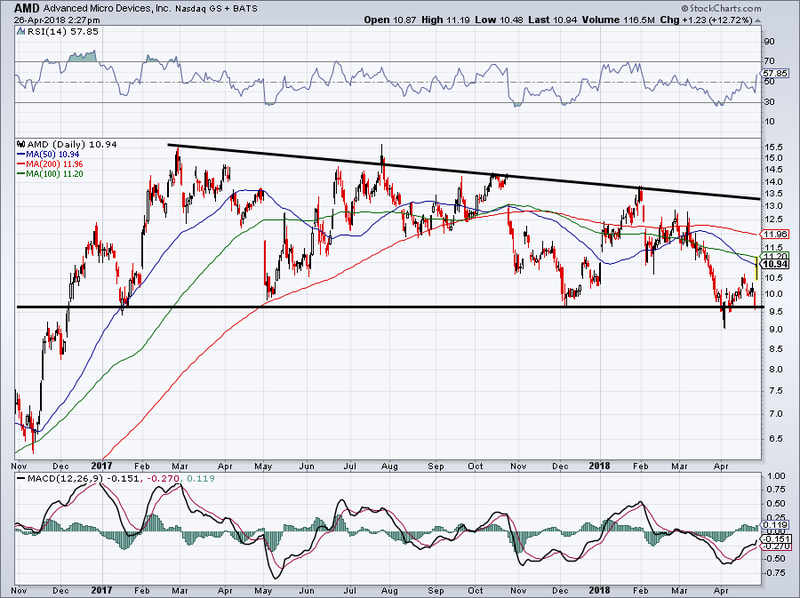 Home Depot Inc (NYSE:HD) is catching a surprising rally on Thursday, jumping almost 5%. We pointed this one out about a week ago as it rallied into resistance. HD faded from that initial rally, but there’s no mistaking Thursday’s breakout. Shares are rallying decisively over the $180 mark, simultaneously pushing through the 100-day moving average as well. While buying closer to the $180 mark is preferred, even bulls late to the party have a chance to jump into HD stock. Buying at $185 and using a closing stop-loss of $180 leaves just $5 per share or 2.7% of potential downside. On the upside, investors can target $205, almost 11% higher than today’s prices and near the current 52-week high. Worth pointing out is that the average price target on Home Depot sits all the way up at $209. So while a rally to new highs seems like a bold call on the surface, I don’t think it’s as aggressive as it seems. Bret Kenwell is the manager and author of Future Blue Chips and is on Twitter @BretKenwell. As of this writing, Bret Kenwell held a long position in AMD, V and HD. 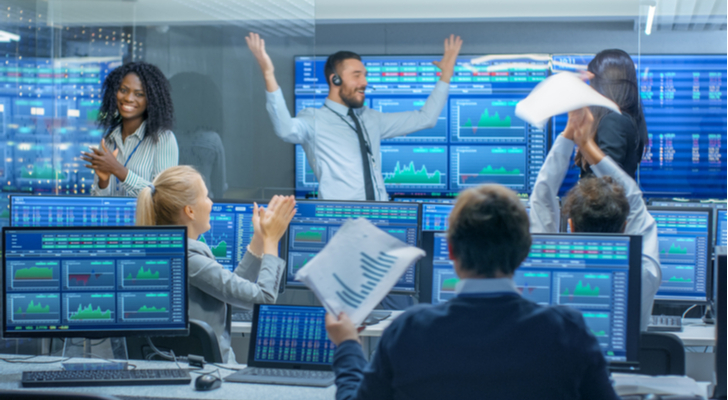 Article printed from InvestorPlace Media, https://investorplace.com/2018/04/5-top-stock-trades-friday-morning/.